If you have a badly damaged tooth or one or more teeth that are missing, Dr Poulos may suggest restoring these teeth using crowns and bridges. A crown is a hollow shell that covers or caps a specially prepared tooth. By completely covering up a tooth so none of its original structure is visible, we can preserve and protect it, preventing infection and decay, all while crafting and creating the desired look of your new tooth or teeth. Once your new crown is in place, your tooth should feel comfortable, allowing you to eat and talk properly. A bridge is made from crowns fitted over the teeth adjacent to the gap and which are called the abutment teeth. The crowns are attached to replacement teeth and each replacement tooth is called a pontic. If your missing teeth are adjacent to each other, we can often use a bridge to replace them. What Will My Crown or Bridge Be Made From? For many years, traditional metal-based crowns have been used to strengthen or rebuild teeth that are heavily worn or which have root canal treatment. Thanks to the latest advancements in cosmetic dentistry, crowns and bridges can now look a lot better that your original teeth. Your beautiful new crown or bridge can be made from porcelain or if you prefer we can give you a truly sparkling smile using gold and diamonds. Porcelain restorations are tooth coloured and will restore or even improve the appearance of the tooth. A tooth coloured crown or bridge may sometimes have a metal substructure, but the very highest quality crowns and bridges do not contain any metal, providing the very best aesthetic results. This is possible thanks to the development of newer porcelains that are extremely strong and durable, allowing us to fabricate even full arch bridges that are entirely metal free. If you are interested in a diamond smile then we only use top quality gems that are beautifully inlaid into precious metals. Dr Poulos can design a smile for you that will be truly unique and valuable. Our diamond crowns are a great way to express your personality and will be custom-designed especially for you. What Is the Procedure for a Crown or Bridge? The original tooth will be prepared to the ideal shape of the crown. This will involve removing most of the outer surface of the tooth leaving the core and tooth root. The thickness of the crown will be the same as the amount of tooth that has been removed. An impression is taken of the area, taking into consideration the bite and overall desired look of the tooth, matching it to the surrounding teeth perfectly. It is a similar procedure for making a dental bridge, as the adjacent teeth will be carefully prepared to create sufficient room for the crowns and for the replacement tooth or teeth. 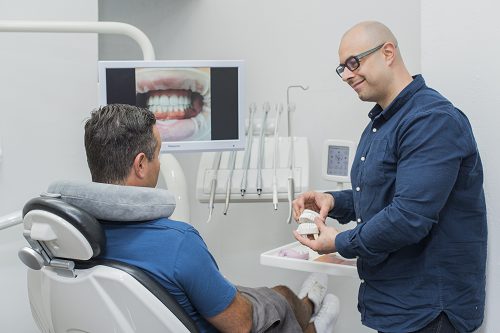 Dr Poulos takes enormous care when designing new crowns and bridges to ensure your new restoration will look and feel wonderful while being fully functional.